Did you know you can automatically save with browser add-ons for Chrome, IE and Firefox? There’s a lot that your web browser can do for you. The search engine feature on Google Chrome is just the tip of the iceberg when it comes to its various features and capabilities. Chrome extensions are mini programs that run with Google Chrome to add additional features and allows you to personalize your browsing experience. Chrome offers a variety of types of extensions perfect for whatever your use. There are Chrome extensions that can help boost your productivity at work or at home. Some extensions enhance your photos you take. There are social extensions that help you better connect with those you need to communicate with. And, Chrome extension can also help you save money in a big way. These Chrome extensions help you get the best deal while shopping online, without having to do much of the work. Most extensions are free to download and utilize, which provides you the perfect opportunity to get new ways to save. Many of these extension work by running in the background as you shop to highlight upcoming deals and savings that you may not be aware of. Here, we walk through nine of the best Chrome extensions you can use for to save money automatically and get access to easy discounts. This browser extension is as sweet as it sounds. The extension Honey has grown in popularity as it has the capability to save users a lot of money. It works by searching the internet for sales and deals of the products you’re looking for. According to Student Loan Hero, when the “H” on the icon turns orange at the top of your browser window, that means Honey has found you a great deal you should check out. 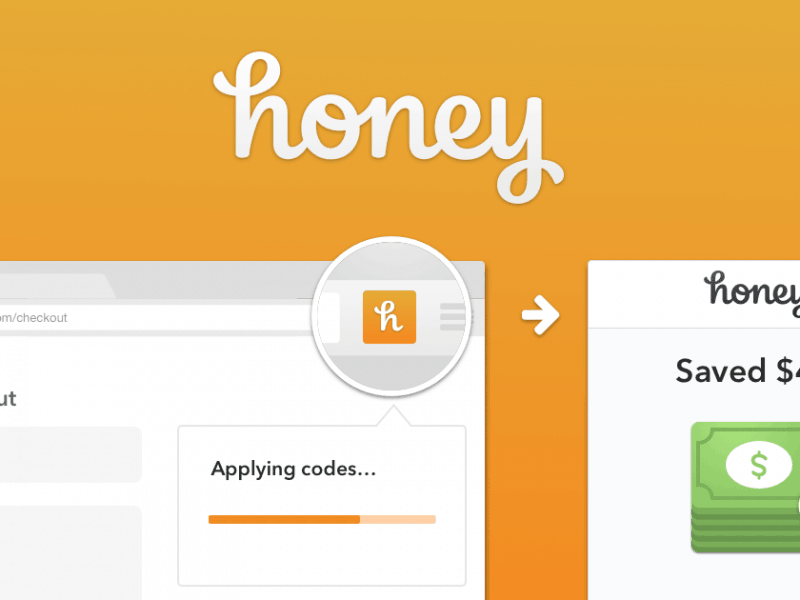 When you’re ready to place your order, Honey will automatically apply the best promo codes to get you the ultimate savings. Honey works through a variety of websites and retailers, so you can be sure to find a great deal wherever you choose to shop. However, Student Loan Hero mentions that the extension may not always be up-to-date. In such case, Honey may try to apply promo codes that are expired. To remedy the case, be aware of expiration dates of codes from websites and retailers. Getting cash back for shopping is a great feeling. With the Chrome extension CouponCabin Sidekick, earning cash back from your purchases can be a quick and easy process. This extension takes the work of scouring the internet for coupons and deals out of the equation and makes it easy to get you deals. The extension works by notifying you of cash back and deal opportunities right in your search results. Whether you search for products right in your search engine or use a top retailer’s site, CouponCabin Sidekick will let you know of what savings you could get. Keeping track of all your offers and cashback opportunities can take a lot of work and effort. But with this extension, your savings come to you when you need them. Knowing where you can get the best savings also helps you determine where you should shop at to get the lowest price. Amazon has become one of the top online retailers. You can find everything from books to shoes to movies to groceries and often anything you could think of. And, Amazon Assistant can help you save even more on all your Amazon purchases. This Chrome extension works by comparing prices of the product you’re looking for across the site. That way, you know you can be getting the best price from the right seller. Student Loan Hero also notes that you’ll get notifications of daily deals you can find on Amazon through Amazon Assistant. Another cool feature is the Universal Wish List option. With this feature, you can create your wish list, or things you’d like to purchase. This wish list works beyond Amazon and includes other sites as well. By being able to compare prices from a variety of sites, Amazon Assistant can help save you time in your shopping and ensure you get the best price out there. Do you ever wish you could track prices of the products, flights, experiences your browsing? With the Chrome extension Invisible Hand, you can. The best part is you barely have to do any work. Like the name suggests, the extension stays in the background, or invisible, until it discovers a deal that you would be interested in. The extension works by scanning websites for prices and compares them for you. Before you make a purchase on a site, the Invisible Hand extension may just notify you of a better price at another site that you’d want to look into. Using this extension takes the guesswork of finding the best deal and ensures the price you pay is the best one out there. The only steps you’ll have to take is enter in promo codes upon checkout that Invisible Hand provides. It’s a quick, efficient and easy way to get the best deal. Another Chrome extension designed for use on Amazon, Camelizer helps you track price history charts. Why would you want this information? It shows you when prices are higher and when they are lower, so you can make your purchase at the right time. Track patterns of the rise and fall of prices with Amazon products. Camelizer even allows you to set price alerts so when there’s a product you’re looking at that comes with a great deal, you can be of the first to know. This extension works with the website camelcamelcamel.com, which provides this important historical pricing data. Gift cards are wonderful. They’re just like cash, except for a particular retailer, restaurant or location. With the Chrome extension Otto, you can get notified of discounted gift cards come right to you. No need to look around for the best deals on gift cards. The savings come right to you. When you add items to your cart online, the extension will automatically find a discounted gift card, if applicable. The process of checking out is quick and easy, and allows you to just copy in the gift code right into the field during check out. Everyone loves to get cash back on what they buy. It’s like getting money just to shop. With the Ebates Cash Back Button, you can discover cash back opportunities just as you would from the Ebates website or Ebates app on your phone. Student Loan Hero notes that Ebates is partnered with over 1,800 stores so you can get deals almost anywhere and everywhere you shop. But this helpful Ebates extension does more than just find you opportunities to get cash back on your purchases from affiliate stores. Ebates Cash Back Button also alerts you of coupons, promo codes and when you can get free shipping just from having the extension on. Like the website or app, Ebates Cash Back Button sends you cash that is credited to your account from purchasing with affiliate stores. All you have to do is get money sent to your Paypal account or via check, which happens every quarter. Discover how this Chrome app can help you get cash back in your pocket. When you’re doing some research into the price of an item you want to purchase, it’s helpful to have the historical data of the price of what you’re looking at. With the Chrome extension Price Zombie, all that historical information comes right to you. While still in a beta version, this extension shows the various prices of an item over time at an affiliated retailer. With over 100,000 retailers and marketplaces in its system, the Chrome extension Cently, or Coupons at Checkout, is a great option to save money when online shopping. The extension works by reminding you of opportunities for savings when you’re about to checkout on an online site. Cently will automatically submit coupon codes and get you the best one to save you the most money. Cently saves you time and money of having to search through or be alerted at random times of coupons or deals you will want to use eventually. With Cently’s powerful database, those difficult to find coupons will come straight to you when you need them most. All this work of finding savings comes to you without having to do any searching yourself. Adding a Chrome extension to your browser is a quick and easy process that can end up saving you a great deal of money in the long run. And, since most of these extensions are free, there’s no up-front investment you’ll have to provide in the extended opportunity to save. Using these extensions is also easy and user-friendly. Most work with a great deal of well-known retailers, so wherever you shop, you can be sure to utilize these great extensions to save money from where you want to purchase from. Check out your Chrome store and see what free extensions you can add today to start saving every time you shop online.